Holiday Sale 2015 | NIS America, Inc.
Limited Editions for a Limited Time! Get a 1 random (out of 4 different Prinnies) Prinny Pal with every order! Like with any other paper crafts, follow the guidelines and bend the correct lines to create a little Prinny that you can display anywhere! 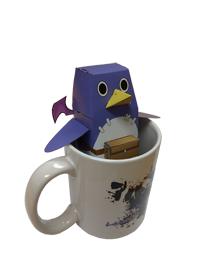 You can also purchase the complete Prinny Pal Squad for $2.99. Here's a little sample of what the Prinny Craft looks like! Disgaea®D2: A Brighter Darkness Limited Edition will be available while supplies last for the reduced price of $74.99! That's $10.00 off MSRP! The Witch and the Hundred Knight Limited Edition for the PlayStation®3 will be available for the reduced price of $44.99! That's $30.00 off MSRP! Criminal Girls: Invite Only Limited Edition for the PlayStation®Vita! Demon Gaze Limited Edition for the PlayStation®Vita! The Guided Fate Paradox Limited Edition for the PlayStation®3! The Witch and the Hundred Knight Limited Edition for the PlayStation®3! Fairy Fencer F Limited Edition for the PlayStation®3! hToL#NiQ: The Firefly Diary Limited Edition & Hyperdimension Neptunia: Producing Perfection Limited Edition are both for the PlayStation®Vita! Ar nosurge: Ode to an Unborn Star Limited Edition for the PlayStation®3! Remember, each of these Limited Editions are very limited in quantity, so grab it before they're gone forever! Are all these options too enticing for ya, dood!? Well, it doesn't stop there! Each day, we will provide a free downloadable Disgaea 2016 calendar, but make sure you come back to the NISA Online Store each day as each part of the free Disgaea 2016 Calendar is available only for 24 hours. On the 7th day, we're giving away an entirely different 2016 Calendar set that includes images of our past titles! Check back on December 1st at store.nisamerica.com/holiday-sale-2015 for all the goodies!